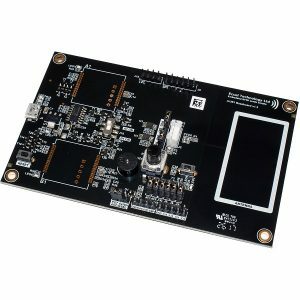 The A1-B1 Baseboard is a low cost and powerful evaluation/development platform for both the RFID-A1 and RFID-B1 modules. 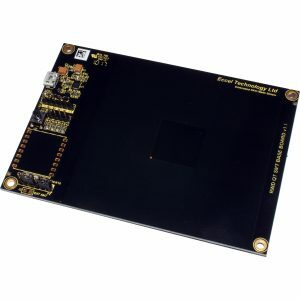 The user can switch between which module to connect to and can switch between the onboard PCB antenna or an external antenna such as our 1-RFID-ANT1356 family. Connection to a PC is via a Micro USB B connector and the device driver for the Microchip chipset on board appears as a virtual COM port in Windows operating systems. There are connectors for development of applications using the A1 and B1 I/O lines including peripherals such as ADC, DAC and PWM, and useful components to connect such as LEDs, Buzzer, a potentiometer and a switch. 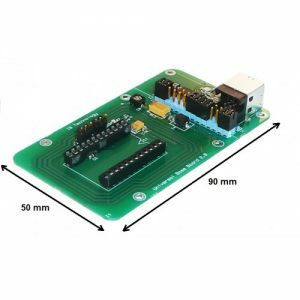 The board does not come with either A1 or B1 modules fitted, in order to keep the cost as low as possible and allow the user to choose either or both modules to fit.